With 10 locations scattered all over the city, Stockfleths is a bit of an Oslo institution. While my niece was here in June, we stopped by their largest location on Prinsensgate for a morning coffee. Once we managed our way around the construction outside, we walked into a clean and well-lit cafe. Not especially unique in its design, but appealing and comfortable all the same. 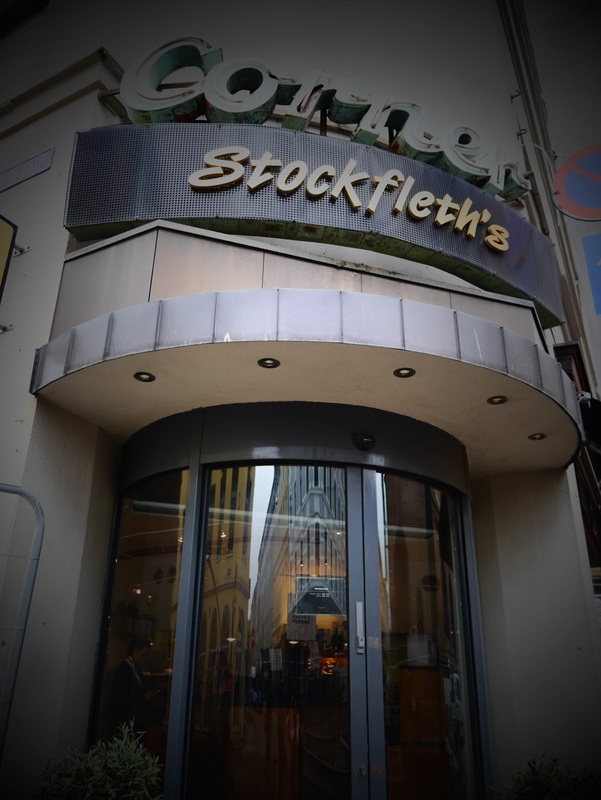 Stockfleths has been around since 1895. They are easy to find throughout the city. With a nice selection of coffee, as well as tea, pastries and sandwiches, it it a good choice for breakfast, lunch, or a coffee break. We were on our way to the airport and a bit short on time, so we opted for their daily coffee. 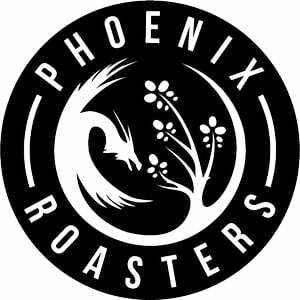 It was a nice medium roast with a good, smooth flavor, although I felt it was served too hot. 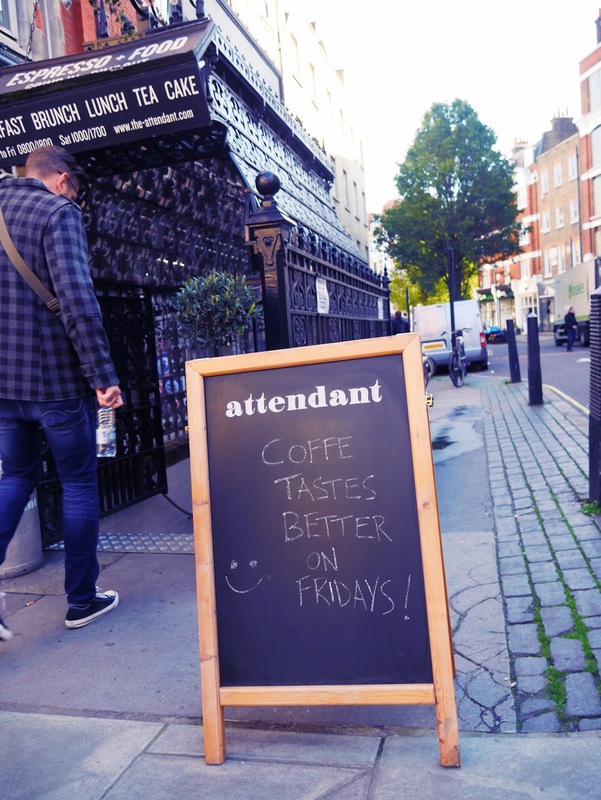 That’s the drawback of getting the daily coffee, I guess! The Prinsensgate location is two stories, and the downstairs also has a room for holding coffee classes. It’s always nice when we can work a quick vacation around a business trip – and particularly when it’s to a place we’ve never visited before. Our recent trip to Portugal started with a couple of days in Lisbon, visiting friends and checking out a really cool city.And of course checking out a really cool coffee shop! Fábrica Coffee Roasters is a newbie. Our barista told us they opened about two months ago. But with high quality locally roasted coffee, a menu that includes great drinks and a nice selection of food, and an atmosphere that makes you want to sit and relax, we feel it’s safe to say Fábrica has the potential to become a favorite for locals and tourists alike. The boys had an ice coffee. It was as delicious as it was cute. Zack and I tried an affogato (espresso shot and ice cream – wow!!) and a V60, as well as an espresso. From the staff, to the drinks, to the presentation: everything was fantastic. Located just a block behind Hard Rock, the location is close to all the action, yet one street makes a big difference in setting up a quieter and less touristy locale. Most of Lisbon’s cafes seemed quite similar to each other. But Fábrica has created a place and space all its own. It’s a must if you find yourself in Lisbon. Check out Fábrica Coffee Roasters on Facebook here. First impressions are important. 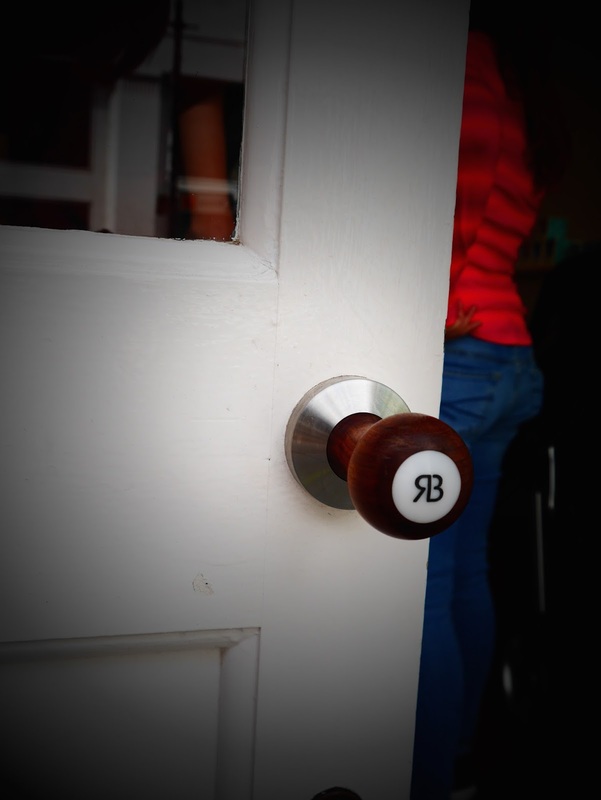 And having an espresso tamper for a door handle gave me a great first impression of Prufrock, in London. 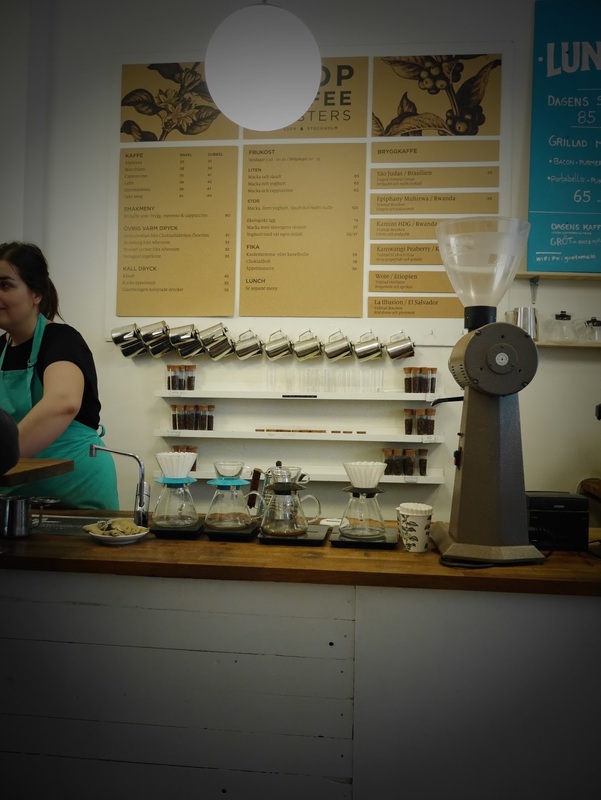 Prufrock is known for fine coffee, as well as barista training courses and coffee lectures. I would love to see something like this in our area. I know a certain husband of mine who would be there in a heartbeat! Once inside, I once again saw many of the elements common to today’s trends in coffee bars. High ceilings and wooden floors, well-lit, and a chalkboard menu. Yes, all the usuals. And yet, it still has its own look and feel. It is a nice size space, with lots of seating and room to move around. Their coffee was great. 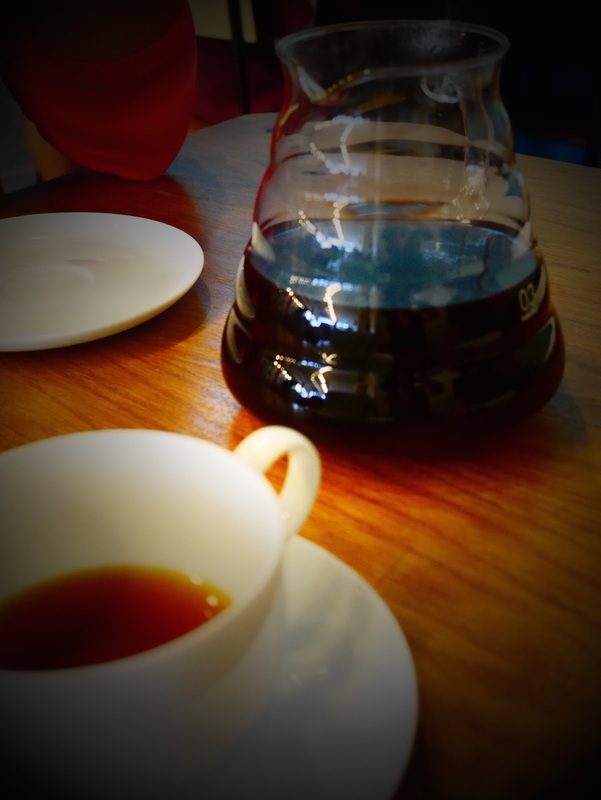 We had the Suko Quto Ethiopia, from Barn in Berlin, served as a V60. We just returned from a long weekend in Stavanger, on the southwest coast of Norway.And before I go any further, I have to say thanks to our friends for letting us stay in their home while they were traveling! I wasn’t having a lot of luck when I did my usual pre-travel coffee research. I did read a bit about a few shops, but nothing much. So I called out to Facebook friends, and got some great advice. The best tip was to try Coffeeberry. And we were so glad we did! Coffeeberry has two locations, in Sandnes and Stavanger. 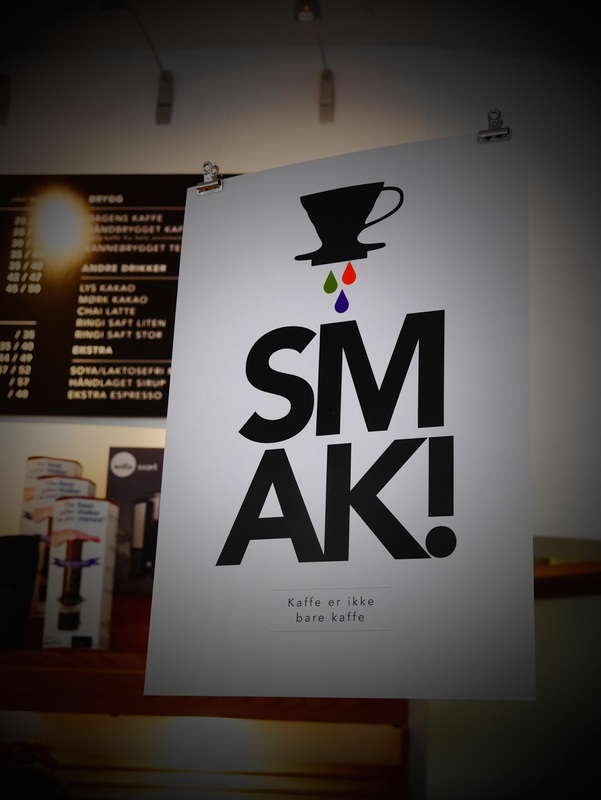 We visited their downtown Stavanger cafe. The decor is done well. 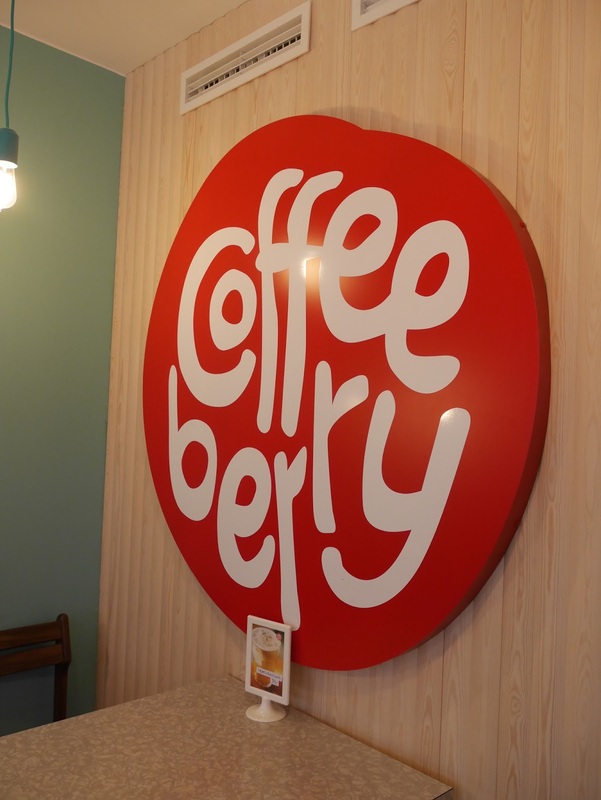 Brightly colored walls on each end reflect the whimsical nature of both Coffeeberry’s logo and their packaging. One end of the shop is painted a bright turquoise, while the other boasts Coffeeberry’s signature bright red. The furniture is retro and fun. A plethora of teakwood furniture fills the shop, and the walls are adorned with what I would consider throwback Norwegian art. Maybe the kind of work you’d see on the walls of your family’s hytta/cabin. As you step in, the focal point is the copper coffee bar. And their wall menus are a playful touch, reminiscent of a diner or sandwich shop from years ago. We visited Coffeeberry twice over the weekend. On the first day, we tried a hand brewed Colombian coffee, and an espresso. Both were excellent. 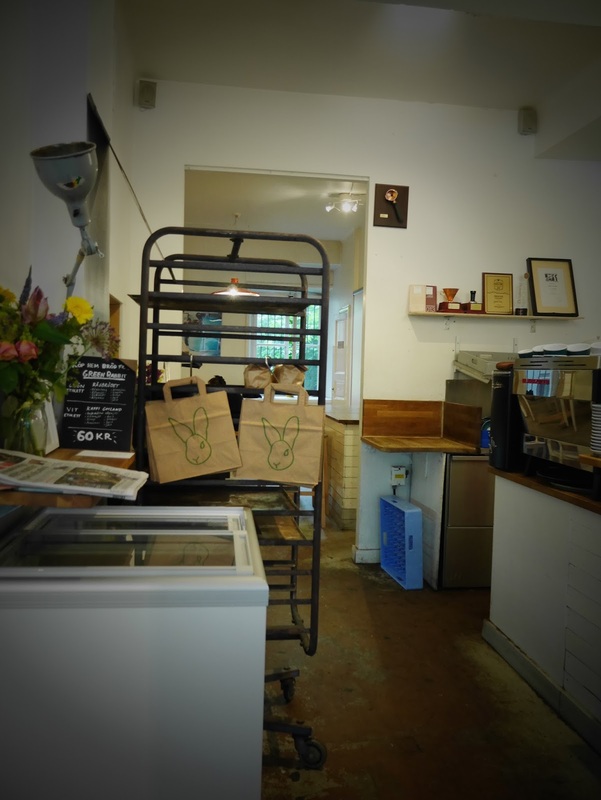 While there we picked up a couple of bags of beans, from Colombia and Ethiopia. On our second visit, we had their daily coffee. This particular day was from Burundi, and was another top-notch choice. We also ordered a con panna (our current go-to specialty drink), a shakerato and a caramel ice latte. Everything we tried was delicious. Coffeeberry also offers a selection of pastries, salads, sodas, and juices. For those of you with small children, you’ll be happy to know that they have a kids’ corner with some toys to occupy your little one while you enjoy your drink. Coffeeberry: another superb offering from the world of Nordic coffee. Definitely worth a stop-in! 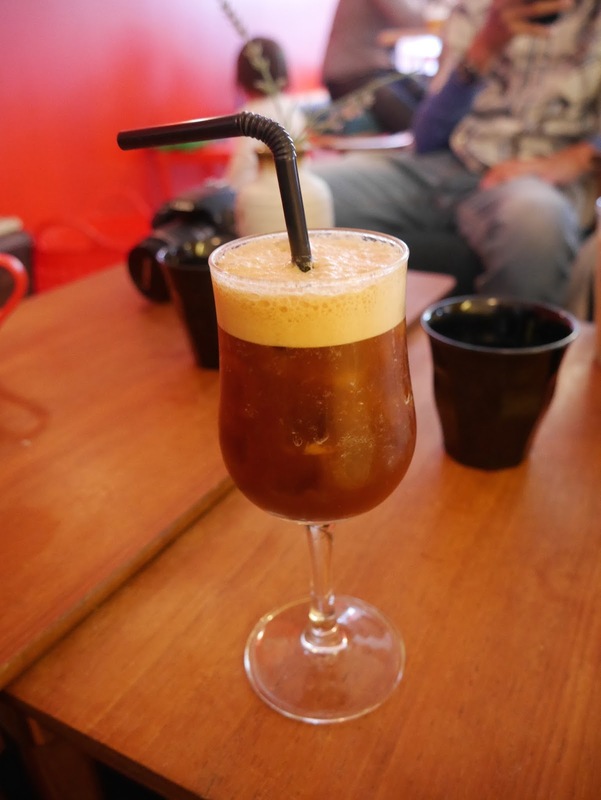 You can also check out our Tastemade review of Coffeeberry! 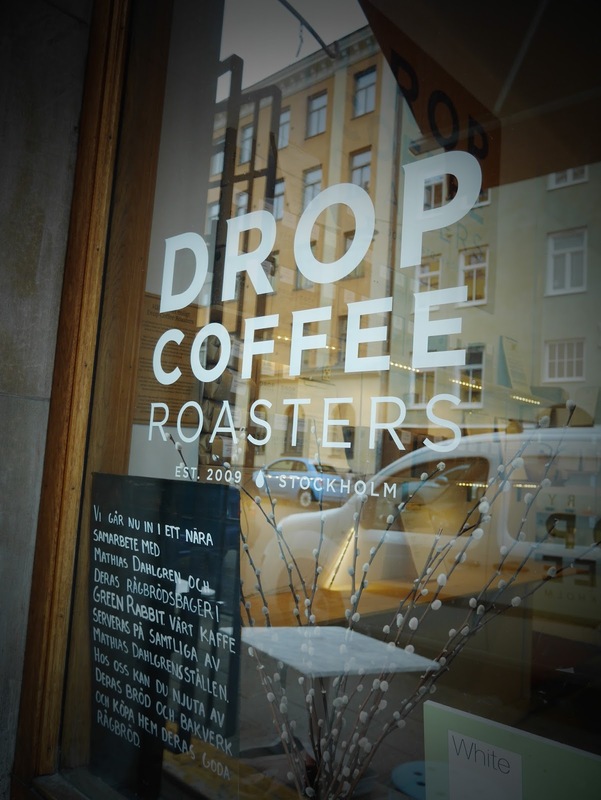 On the very top of my must-see/must-do list for Stockholm is Drop Coffee. If you like coffee, start your day here. Would it be to cliche to say you must Drop by? Yeah, I thought so. Drop is a fairly NKOTB. That’s new kid on the block for those of you who didn’t have the privilege of growing up in the 80’s. It’s been around since 2009. But don’t let its age fool you. It is legit. The space is clean and simple. The food is art. And the baristas really know what they’re doing. On my most recent trip, I ordered a pour-over from Ethiopia. Anna tried their São Judas from Brazil. Both were delicious. Scandinavia knows their coffee, and Stockholm has some great offerings. In my opinion, Drop is right on top of the list for this fantastic city. While it is not in the heart of the most touristy part of the city, its location in Södermalm is well worth the visit. And Södermalm is a pretty cool area anyway!